Professionalism, attention to detail, creativity and commercial sensitivity: Sullivan & Cromwell's Mergers and Acquisitions Group brings these virtues to every representation, for every client. S&C represents major international corporations in the world's largest and most noteworthy transactions. It also represents smaller corporations whose transactions, while modest in monetary value, involve enormous strategic significance for them. Teamwork is a hallmark of S&C. Lawyers from multiple disciplines and offices within the Firm work with each other and with the client, as well as with investment bankers, accountants, proxy solicitors and other advisers. This close collaboration with clients and colleagues gives the M&A team great versatility. The Group can execute any type of transaction, in any industry, economic climate or geographic region. Guided by clients' commercial objectives and S&C's deep experience, the Firm seeks to provide the best possible advice to achieve these objectives. As S&C lawyers meet the needs of the buyer and seller, they simultaneously aim to achieve the best possible terms for clients while helping them resolve issues in a commercially sensible matter with a view toward the overall success of the transaction. Sullivan & Cromwell has broad experience in public company M&A transactions, including many of the largest and most transformative M&A transactions in corporate history. The Firm understands the significance of these transactions, whatever their size, to S&C's clients. The extreme dedication to client service, attention to detail and commercial pragmatism of the Firm's lawyers helps us partner with clients to accomplish their most important transactions. S&C has helped clients successfully navigate the legal and commercial complexities of cross-border and multijurisdictional transactions in every region of the world, and it has done so for almost all of the Firm's 135-year history. The myriad complex issues arising from competing jurisdictional legal demands and requirements provide opportunities to demonstrate the creativity and problem solving abilities of the Firm's lawyers. S&C uses its tightly-integrated global office network and a unified culture to successfully structure and execute these complex transactions. Recent years have highlighted the significant risks to participants in going-private and other conflict transactions. S&C has a deep understanding of the substantive approach and scrupulous processes that are necessary to protect a board of directors and other participants in an extremely litigious environment. The Firm's unified culture facilitates an effective, efficient partnership between its corporate and litigation lawyers, enabling the Firm to provide sophisticated, forward-thinking advice in both executing and defending these transactions. The Firm's strong credit and leveraged-finance practices round out the team's offerings by providing creative and novel approaches and a deep knowledge of current credit and leveraged finance practices. S&C has years of experience assisting clients strategize in support of, and in defense of, unsolicited transactions. The Firm's small-team, interdisciplinary approach facilitates the effective execution of these fast-moving transactions, both on offense and defense. The Firm's deep experience in these transactions helps clients anticipate, prepare for and respond effectively to counterparty and third-party actions. Private transactions offer a wide range of opportunities for lawyers to benefit their clients through sound legal and commercial advice on the highly bespoke processes and contracts that are the hallmark of private M&A. Meticulous attention to detail and intense focus on significant commercial points can make a meaningful difference for the Firm's clients. S&C lawyers seek to make that difference on every transaction on which the Firm works. S&C brings to bear many of its hallmark strengths in these transactions, which require an understanding of commercial realities and a pragmatic approach in order to find creative and highly tailored solutions to the complex issues raised. 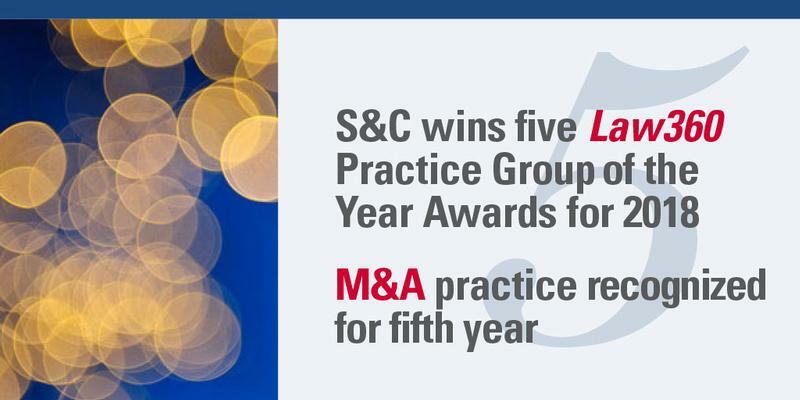 Clients especially benefit from S&C's highly collaborative culture in these transactions where coordination among the legal and business teams is critical to a client's success. As the relationships between shareholders and managements are redefined, S&C increasingly is called upon to help boards and managements understand, prepare for and navigate the world of the activist shareholder. The capacity of the Firm's lawyers to form a broad, interdisciplinary perspective is critical to developing advice for directors and managements that is tailored to each particular company and situation. These transactions require careful planning and seamless orchestration of multiple legal disciplines to ensure that all client objectives, including financial, strategic, tax and accounting objectives, are met. S&C's tightly integrated, multidisciplinary team has the resources and breadth of knowledge in M&A, tax, capital markets, executive compensation and other subject-matter expertise to provide clients with unified best-in-class advice. ACE Limited (Switzerland), in its $29.5 billion acquisition of The Chubb Corporation (U.S.). Advance/Newhouse (U.S.), in connection with Discovery Communications’ (U.S.) $14.6 billion acquisition of Scripps Interactive (U.S.). Alcatel-Lucent (France), in its $16.6 billion acquisition by Nokia (Finland). Alibaba Group (China), in its $2 billion investment in Lazada Group (Singapore). Altran (France), in its $2 billion acquisition, through its subsidiary Altran US, of Aricent (U.S.). Amazon.com (U.S.), in its $13.7 billion acquisition of Whole Foods Market (U.S.). Amgen (U.S.), in its $10.5 billion acquisition of Onyx Pharmaceuticals (U.S.). Andeavor (U.S.), in its $35.6 billion acquisition by Marathon Petroleum (U.S.) and $6.4 billion acquisition of Western Refining (U.S.). Anheuser-Busch InBev (Belgium), in its $123 billion merger with SABMiller (U.K.) and $20.1 billion acquisition of the remaining stake it didn’t already own in Grupo Modelo (Mexico). AT&T (U.S.), in its $108.7 billion acquisition of Time Warner Inc. (U.S.) and $67 billion acquisition of DIRECTV (U.S.). Bayer (Germany), in its $66 billion acquisition of Monsanto (U.S.), sale of selected crop science assets to BASF (Germany) and $14.2 billion acquisition of Merck’s (U.S.) consumer care business. BBA Aviation (U.K.), in its $2.1 billion acquisition of Landmark Aviation (U.S.). BHP Billiton (Australia), in its $15.1 billion acquisition of Petrohawk Energy (U.S.). Columbia Pipeline Group (U.S.), in its $13 billion acquisition by TransCanada. Concho Resources (U.S.), in its $9.5 billion acquisition of RSP Permian (U.S.). CVS (U.S.), in its $12.8 billion acquisition of Omnicare (U.S.). Diageo (U.K.), in its $1 billion acquisition of Casamigos (U.S.) from founders George Clooney, Rande Gerber and Mike Meldman. Diebold (U.S.), in its $1.8 billion merger with Wincor Nixdorf (Germany). Drillisch (Germany), in its $10 billion business combination with United Internet (Germany). Enbridge (Canada), in its $43 billion acquisition of Spectra Energy (U.S.). ENN Energy China Investment, a wholly owned subsidiary of ENN Energy Holdings Limited (Cayman Islands), in its $17.5 billion equity investment (representing a 1.12% equity interest) in Sinopec Marketing (China). Fiat (Italy) and Chrysler (U.S.), as counsel to Fiat in its alliance with Chrysler and New Chrysler’s $2 billion bankruptcy acquisition of the assets of Old Chrysler and as counsel to Chrysler Group (U.S.) in the follow-on $10.5 billion acquisition of a majority stake by Fiat. Fiat Chrysler (U.K.) and Magneti Marelli (Italy), in the $7.1 billion pending sale of the Magneti Marelli automotive components business to KKR (U.S.) portfolio company CK Holdings Co. (Hong Kong), a holding company of Calsonic Kansei Corporation (Japan). Fiserv (U.S.), in its $22 billion pending acquisition of First Data Corporation (U.S.). Forest City Realty Trust (U.S.), in its $11.4 billion acquisition by Brookfield Asset Management (Canada). GE (U.S.), in its sale of most GE Capital (U.S.) assets in a series of transactions valued at approximately $26.5 billion. General Cable (U.S.), in its $3 billion acquisition by Prysmian Group (Italy). GGP (U.S.), in its $28 billion acquisition by Brookfield Property Partners (Bermuda). Harris Corporation (U.S.), in its $35 billion pending merger of equals with L3 Technologies (U.S.). Impax Laboratories (U.S.), in its $5.5 billion merger with Amneal Pharmaceuticals (U.S.). InBev (Belgium), in its $60.8 billion acquisition of Anheuser-Busch (U.S.). Kite Pharma (U.S.), in its $11.9 billion acquisition by Gilead Sciences (U.S.). Kraft Foods Group (U.S.), in its $55 billion merger with H.J. Heinz Company (U.S.) to form The Kraft Heinz Company. Major League Baseball (U.S.) and MLB Advanced Media (U.S.), (MLBAM), in connection with the sale of a majority ownership interest in MLBAM’s subsidiary, BAMTech (U.S.), to The Walt Disney Company (U.S.) for $1.58 billion. Panera Bread (U.S.), in its $7.5 billion acquisition by JAB (Luxembourg). Pepco Holdings (U.S.), in its $6.6 billion acquisition by Exelon (U.S.). Perrigo (U.S.), in its $8.6 billion acquisition of Elan Pharmaceuticals (Ireland). Praxair (U.S.), in its $80 billion merger of equals with Linde (Germany). RR Donnelley & Sons (U.S.), in the spin-off of its financial print and PRS businesses to create three independent, publicly traded companies. State Grid (China), in its $13 billion acquisition of a 94.8% stake in CPFL Energia (Brazil). Stemcentrx (U.S.), in its $9.8 billion acquisition by AbbVie (U.S.). Stryker (U.S.), in its $2.8 billion acquisition of Sage Products (U.S.) from Madison Dearborn (U.S.). Suncor Energy (Canada), in its $4.6 billion acquisition of Canadian Oil Sands. SunTrust Banks (U.S.), in its $66 billion pending merger of equals with BB&T Corporation (U.S.). Synageva (U.S.), in its $8.4 billion acquisition by Alexion Pharmaceuticals (U.S.). Syneos Health (U.S.), in its $7.4 billion merger of equals with inVentiv Health (U.S.). Syntel (U.S.), in its $3.57 billion acquisition by Atos (France). Taiwan Cement Corporation (TCC) and TCC International Limited (Hong Kong), in their privatization of TCC International Holdings (Hong Kong) by way of a scheme of arrangement. TerraForm Power (U.S.), in its $4 billion sale and TerraForm Global (U.S.) in its $1.3 billion sale to Brookfield Asset Management (Canada) and a related settlement of claims with parent SunEdison. Teva Pharmaceutical (Israel), in its $40.5 billion acquisition of Allergan Generics (Ireland). UnitedHealth Group (U.S.), in connection with its $2.8 billion acquisition of Empresas Banmédica’s (Chile), Optum’s (U.S.) $4.3 billion pending acquisition of DaVita Medical Group (U.S.), the $12.8 billion combination of its free-standing pharmacy care services business OptumRx with Catamaran Corporation (U.S.) and in its $4.9 billion acquisition of Amil Participações (Brazil). Verifone Systems (U.S.), in its $3.4 billion acquisition by an investor group led by Francisco Partners (U.S.). Vornado (U.S.), in the spin-off and $8.4 billion merger of its Washington, D.C. business with The JBG Companies (U.S.) to form JBG Smith Properties. The Weir Group (U.K.), in its $1.285 billion acquisition of ESCO (U.S.). ZF Friedrichshafen (Germany), in its $12.4 billion acquisition of TRW Automotive (U.S.). 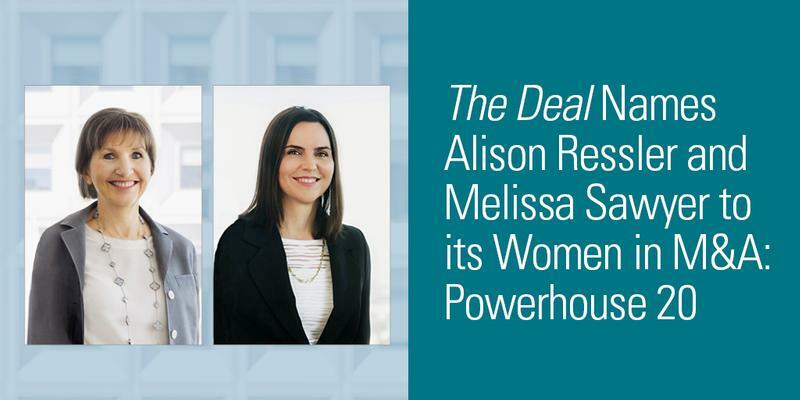 Latest news, perspectives, intelligence and thought leadership, presented by the M&A team at Sullivan & Cromwell.